After a cheek injury and surgery that forced him to be out for one game, the Oklahoma City Thunder point guard returned at 100%. This wasn’t just any return. Westbrook scored a career high 49 points, career high 16 rebounds and to top it all off, 10 assists. It was a hard fought battle between two teams with different aspirations. One who is waiting anxiously for the season to end and the other who is trying to stay alive in the Western Conference playoff race. The tanking Sixers still managed to take them to overtime, but of course it wasn’t enough as Westbrook practically carried his team to a much needed victory. Westbrook became the first player to have four consecutive triple doubles since the legend Michael Jordan who holds the record with seven in a row in 1989. Who else is in the four consecutive triple double list? Magic Johnson, Oscar Robertson, Wilt Chamberlain and Maurice Stokes. The record setting night didn’t end there, he also tied Larry Bird for most points in a triple double in the past 30 seasons with 49. Incredible. 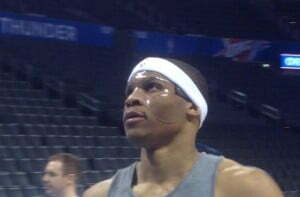 Just last week, Westbrook’s face was literally dented by an accidental knee to the cheek from teammate Andre Roberson. It didn’t matter as he showed the NBA fans how it’s done with a record setting performance. Wearing a facemask and an upside down headband which will likely cost him some money, he drove hard to the paint right away and dove through crowds of defenders play after play. His first points came at the 8:45 minute mark of the first quarter. His efforts at the time weren’t enough as the Sixers took a small 8 point lead late in the 3rd quarter. Late in the 4th, the Thunder clawed back from a big deficit to tie the game and eventually end up in overtime. The OKC run to tie the game was started by a crazy play from Westbrook who took the ball from his side of the court and ran straight away through the court for a jaw dropping dunk that left Philly players stunned and seeking for answers. 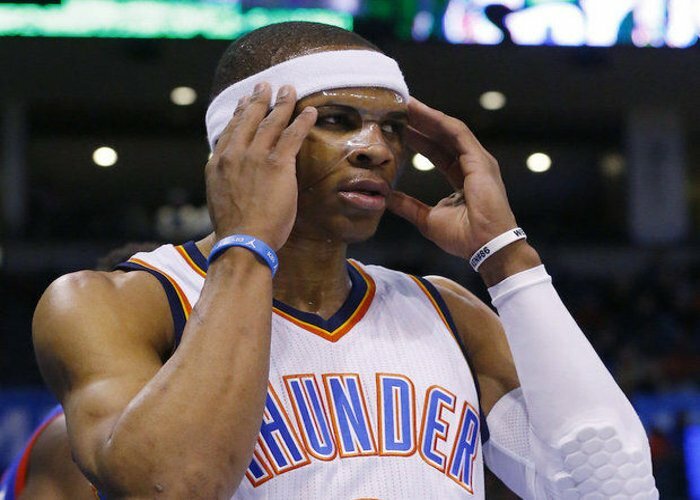 The Thunder are scheduled to take on teams depleted by injuries. Next game will be against the Toronto Raptors who are without their biggest star Kyle Lowry. 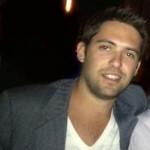 Then they face the Griffinless Clippers who are a tough team but very inconsistent. Easy right? It gets better as they play the awful Minnesota Timberwolves and the Chicago Bulls who just lost two of their stars. Even with their best player Kevin Durant out with multiple injuries, the Thunder have managed to stay in the race and today was just another step to make it into the playoffs. Do they have a shot with KD out? Westbrook might not win the MVP this year due to the injuries suffered early in the season but he’s revolutionizing the game with his sensational play. If he keeps this up, I think next season we will see Russell Westbrook take the MVP trophy. Previous articleHBO Online Only Streaming Service Is Here!